3" inseamTrunks made with 95% Viscose from Bamboo, 5% Spandex blend are moisture wicking, extra cooling, and soft like cotton. Medium-low rise. All-day comfort. Available in Black, Red, Gray, and Royal Blue. 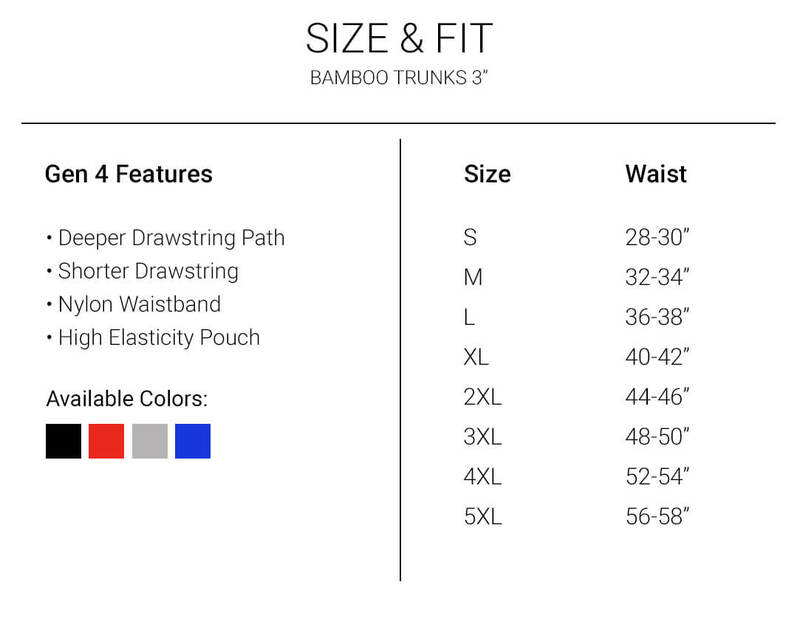 Men that want underwear with a cottony-like feel, that prevents chafing, rubbing, sagging, and sweating, wear 4th Gen UFM REG Support Trunks made with Bamboo and Spandex. Every pair of UFM Men’s Underwear has a US patented and Intl patents pending adjustable pouch that isolates, supports, and lifts. The lightweight fabrics wick sweat and dry quickly. The soft, breathable pouch gently adjusts to each man’s desired level of comfort and support. Tie the drawstrings tight for extra support or light for loose support.